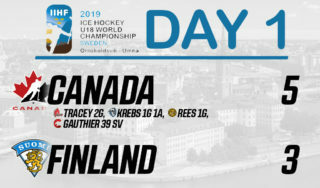 The road to the 2019 IIHF World Junior Championship in Vancouver and Victoria, British Columbia, this December began this past week in Kamloops at the 2018 World Junior Showcase featuring 40 of Canada’s National Junior Team hopefuls and an overall assembly of 47 Canadian Hockey League stars. 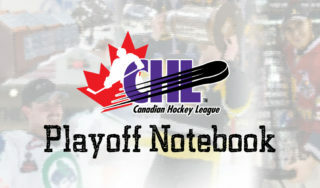 Here’s a closer look at all 11 games highlighting top CHL performances. Rickard Hugg (Kitchener Rangers) scored shorthanded at 17:28 of the third period to provide Sweden with insurance to claim their first win of the showcase. This was the first test for the United States with a split squad that featured forwards Sasha Chmelevski (Ottawa 67’s) and Jacob McGrew (Spokane Chiefs), along with defenceman Alec Regula (London Knights) in action. San Jose Sharks prospect Sasha Chmelevski (Ottawa 67’s) scored the game’s first and last goals lifting USA Blue to their first win. Arizona Coyotes first round pick Barrett Hayton (Soo Greyhounds) and Vegas Golden Knights prospect Cody Glass (Portland Winterhawks) scored for Canada White. Boston Bruins prospect Kyle Keyser (Oshawa Generals) picked up the win in goal with 23 saves opposite Olivier Rodrigue (Drummondville Voltigeurs) 8/10 and Matthew Welsh (Charlottetown Islanders) 13/14. Ivan Lodnia (Erie Otters) and Jason Robertson (Kingston Frontenacs) each scored once with an assist in USA White’s second straight win. Antoine Morand (Halifax Mooseheads) tied for the Canada Red lead with a goal and an assist while his former Acadie-Bathurst Titan teammate Noah Dobson chipped in a goal. Columbus Blue Jackets first round pick Liam Foudy (London Knights) tallied two assists with other Canada goals coming from Nick Suzuki (Owen Sound Attack) and Isaac Ratcliffe (Guelph Storm). Michael DiPietro (Windsor Spitfires) 13/18 and Matthew Villalta (Soo Greyhounds) 12/13 split goaltending duties in their showcase debut. Returning National Junior Team gold medalist Maxime Comtois (Drummondville Voltigeurs) scored the OT winner at 4:33 of the extra frame with help from fellow Anaheim Ducks prospect Antoine Morand (Halifax Mooseheads) and Calen Addison (Lethbridge Hurricanes) who had two assists. New York Islanders first round pick Noah Dobson (Acadie-Bathurst Titan) had two goals and Detroit Red Wings prospect Michael Rasmussen (Tri-City Americans) finished with a goal and an assist. Matthew Welsh (Charlottetown Islanders) got the start in goal making eight saves on nine shots, with Olivier Rodrigue (Drummondville Voltigeurs) earning the win with nine saves on 11 shots. Four different goal scorers helped pace Canada’s offense leading to a second straight showcase victory. Jared McIsaac (Halifax Mooseheads), Alex Formenton (London Knights), MacKenzie Entwistle (Hamilton Bulldogs), and Joel Teasdale (Blainville-Boisbriand Armada) each found the back of the net. Matthew Villalta (Soo Greyhounds) was perfect in goal with eight saves giving way to Michael DiPietro (Windsor Spitfires) who finished the game with 18 saves on 19 shots. Ty Dellandrea (Flint Firebirds) and Jack Studnicka (Oshawa Generals) had a goal and an assist each leading Canada to a third consecutive win to wrap up showcase action for the hosts. Canada built a four-goal lead with additional singles from Nick Suzuki (Owen Sound Attack), Michael Rasmussen (Tri-City Americans) and MacKenzie Entwistle (Hamilton Bulldogs) before the Americans battled back to tie the game. Pittsburgh Penguins prospect Calen Addison (Lethbridge Hurricanes) broke the 5-5 tie with his second goal of the showcase at 4:01 of the final frame. 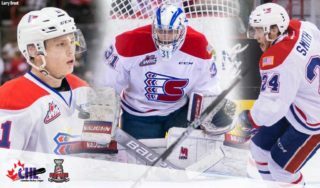 Los Angeles Kings prospect Jaret Anderson-Dolan (Spokane Chiefs) provided two assists for Canada, while Sasha Chmelevski (Ottawa 67’s), Joey Keane (Barrie Colts), and Jason Robertson (Kingston Frontenacs) all contributed single assists for USA. Matthew Welsh (Charlottetown Islanders) started for the Canadians and made 11 saves on 13 shots before giving way to Matthew Villalta (Soo Greyhounds) who made 23 saves on 26 shots in the game’s second half.